Wow! Goodbye 2017! What a crazy year! 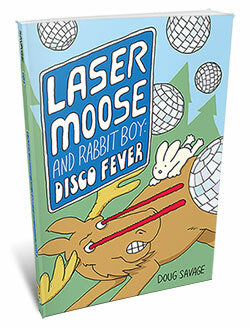 Crazy around the world, of course, but also crazy for me personally since I spent most of the year busily putting together the Laser Moose sequel, Laser Moose and Rabbit Boy: Disco Fever. Here are the most-visited comics from the past year! Thanks and see you in 2018! Thanks for another great year everybody. After 13 years, I’m still having so much fun drawing the chickens, mostly because of you and your encouragement. And it’s been really fun to expand my work into new territory with what is now a series of graphic novels. Next up for me, book 3 of Laser Moose and Rabbit Boy! Here’s hoping for a great 2018! Reading a new chicken is always a great start of my working day. That said, I totally missed “The beauty of nature”. This one made my last day of the year, so I nominate it as my favourite of 2017? I always look forward to my daily chicken email! Home was a favorite for me this year! I mean of course my fave is birthdsy dtrip. Youre the best and i share often! WORRY! I love that one! So right on the mark. I’m a shrink, who works in (wait for it) Shrinkville! We are one profession that doesn’t seem to be able to laugh at itself – and aren’t we all healthier when we can see our own ridiculousness?! There were so many cartoons that I love – so hard to choose. I may need to talk this over with my therapist! This comment made me laugh. I love “The New Christmas”! And I’m sure Santa does too! The one that says “this just in – everything’s still crappy” or something to that effect! Or just all of them, forever ???? I think the one that made me laugh the most was Koalaman. I really didn’t expect that last panel but it fits the kind of superhero I’d be. I think this was an excellent year of Savage Chickens comics, Doug! Thank you for delivering much needed laughter every morning! My favorite comic this year was probably the Pi Day one. However, the ones listed in both Top 10s are excellent as well. Happy New Year, and Good luck with writing Laser Moose and Rabbit Boy 3 in 2018! Haha! I can totally relate to “new worlds”. I’ve stayed up WAY too late more than once in my life! As a fellow cartoonist and aspiring cartoon-website owner, I look up to you for bringing us this. You, sir, are an amazing man and I hope you the best since you deserve it. 2017 was great, and I can’t wait to see what 2018 brings us now, including your amazing work. Keep at it. I liked the one with the chicken and the other chicken. You know which one I mean. I liked ‘A New Beginning’ and also, ‘The Dark’. “Who’s a good dog?” Bwa-ha-ha-ha-ha-ha-ha. I look forward to a morning dose of chickens before work everyday. I love them all! I am torn between so many… I love Relax and New Worlds… Morning Person… it’s a giant mug kind of day…. Thanks for the great comics all the time!! July 17 on Abstract Art was an instant classic. But you have at least 2 or 3 of those a month! It’s like a reverse engineered branding decision. My favorite from 2017 is from november 7th. It came at just the right time, when my boss started to take an interest in his own department after having ignored half of us for the most part of the year. I have Front Desk duty in the am, so a Savage Chicken fix is needed daily. Love jenkins the office cat!!!! Thank you for many smiles over the past couple of years. Although I don’t know why it is my favorite; when I used to write, I really liked getting my editor’s input. There was just the one time he asked for a *big* rewrite, and it really made GL for a better article. Doug: I am in awe of your creativity and output. How you manage to maintain such a high level of quality 6 days a week is beyond me. You give me an out-loud chuckle at least once a week, and all of them give me a smile. Thank you! PS: My niece, who isn’t much of a reader, loves Laser Moose and Rabbit Boy. Keep ’em coming!! Why do cats always win? I am so glad you are still enjoying it. I never get tired of the chickens! My favorite is the little chicken. Have you ever used an egg? What would a baby chicken in an egg think of the world? Thanks again for the laughs!